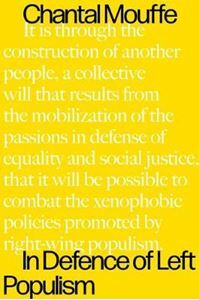 Quick overview What is the 'populist moment' and what does it mean for the left? Populism, today, is the expression of a crisis of liberal-democratic politics. It is more than an ideology or a political regime. It is a way of doing politics that can take various forms but emerges when one aims at building a new subject of collective action - the people. In this new book the leading political thinker Chantal Mouffe proposes a new way to define left populism. The political is to be constructed by establishing a political frontier that divides society into two camps, mobilising an "underdog" against "those in power". Populism, far from being a perversion of democracy, constitutes the most adequate political force to recover and reconstitute itself. This new politics must recognise its partisan character. This presents itself as more than the image of demagoguery and emotive rabbles seen across our media. Furthermore, it is an urgent struggle, because the future will be formed by the kind of populism that emerges victorious from the conflict against the current threats of post-politics and post-democracy.